Oh, Opus 40. 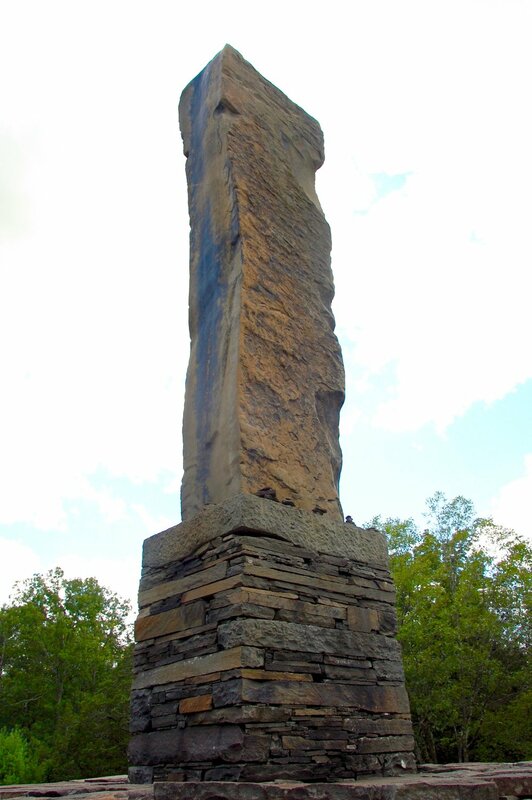 This wondrous, bewitching Saugerties sculpture park of swirling slate and labyrinthine paths was hand-built by Harvey Fite, an artist and professor of sculpture and theater at Bard College. The place feels a bit like an M.C. Escher Impossible Construction lithograph come to life. Before our visit, we read about this environmental sculpture's fascinating history, but we had trouble finding an answer to one burning question: Is is safe for kids? Well, it depends on the kid. 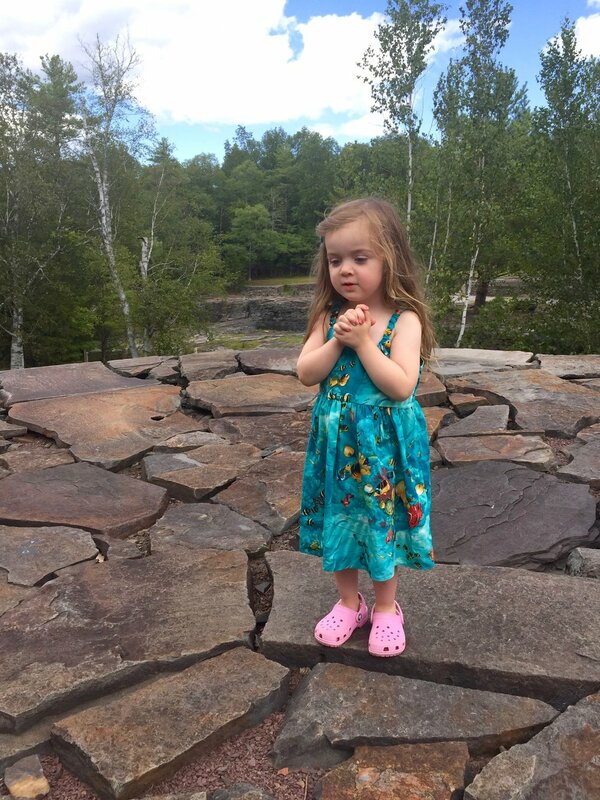 With steep staircases, long drops into pools of unclear depths, and no railing anywhere, this is not the place for a daredevil toddler. However, our cautious 7-year-old loved it, especially the chilly narrow underpass pictured below, in which the temperature seemed to drop about 10 degrees. 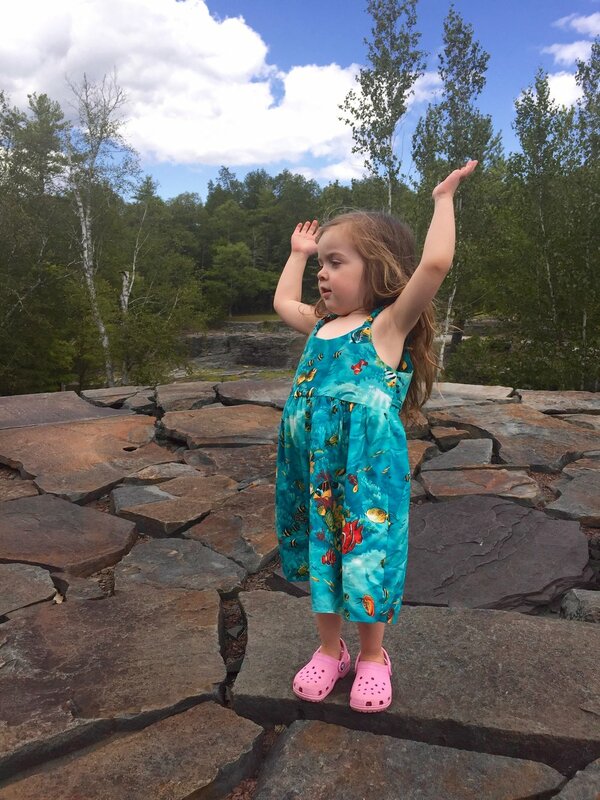 Our harder-to-please 3-year-old happily made her way up to the 9-ton bluestone monolith at the highest point of the park and proceeded to cast some spells. This was a little creepy for the rest of us. You can't really fathom the intricacy of the stonework and the vastness of Opus 40 unless you visit yourself. Below, you can get a sense of how large the slates are under my hand. But it's hard to express the queasiness I felt when staring into the steep and narrow 10 or 12-foot drop, pictured just ahead of my feet below. 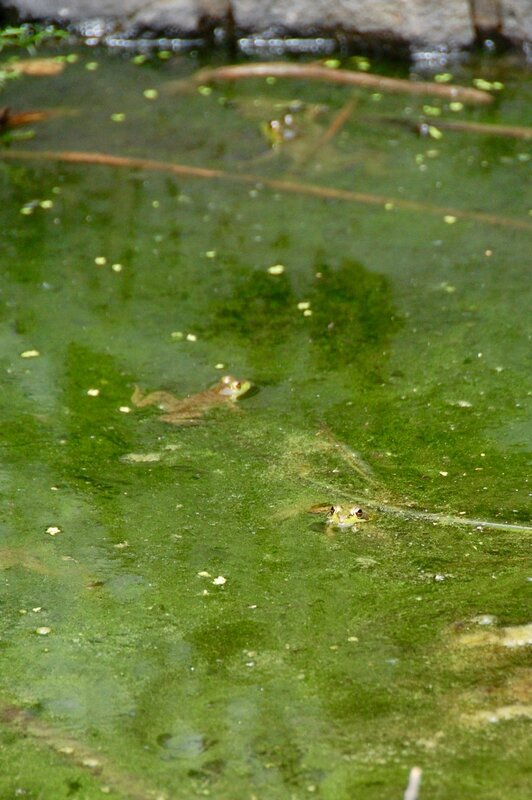 This sculpture garden has such vibrancy, surrounded by grass and trees, weeds and moss poking out from cracks, algae-rich pools teeming with golden-eyed frogs. 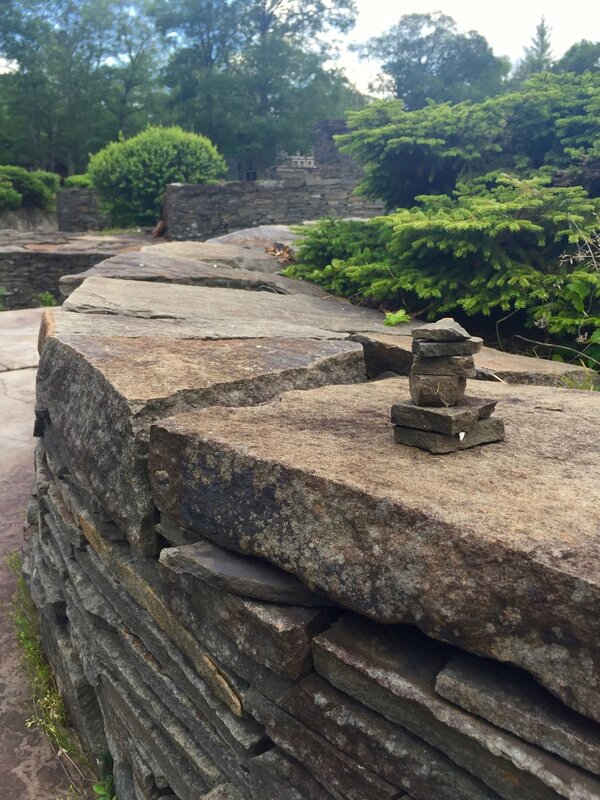 In some expanses of stone, it feels as though the slates themselves are alive and multiplying, setting off shoots of baby rock piles. 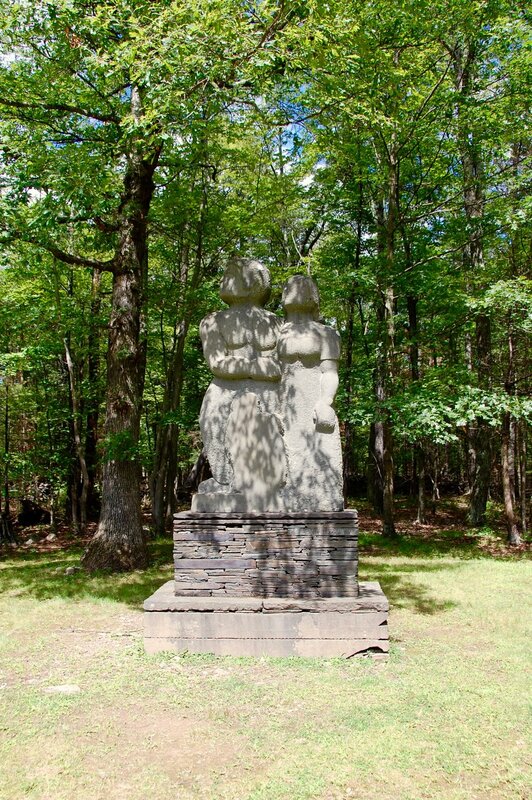 The smooth, rounded lines of Harvey Fite's stone sculptures, in stark contrast with the sharp edges of the slates, can be found around the grounds as well. 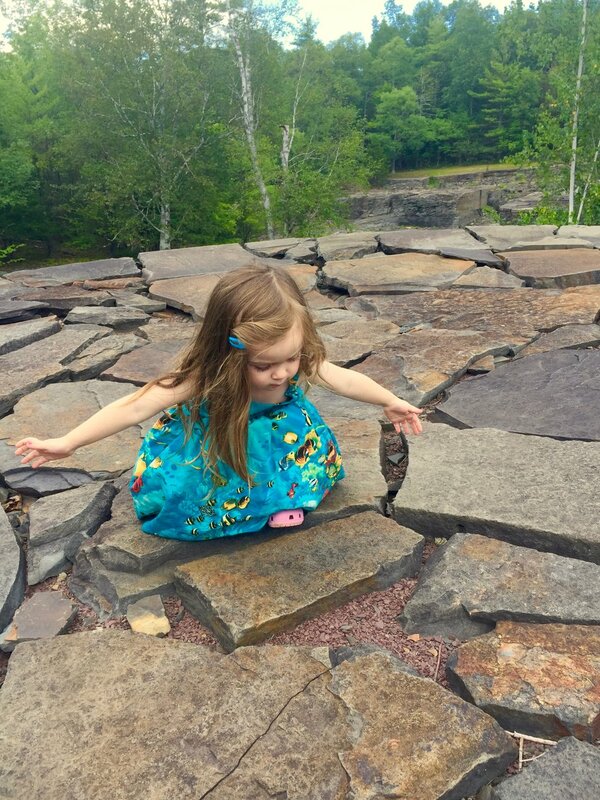 Opus 40 is a fine place to embrace a childlike sense of wonder. But if you've actually got little kids, we'd recommend a 1:1 adult-to-child ratio here. Pro tip: You're gonna want a snack after your visit, and although Opus 40 feels very remote, it's only 15 minutes away from Jolly Cow Ice Cream! Opus 40 is open Memorial Day through October 15, from noon to 5pm on Fridays, Saturdays (unless reserved for a special event) and Sundays. Members and groups can visit by appointment. For information, call 845-246-3400 or visit www.opus40.org.